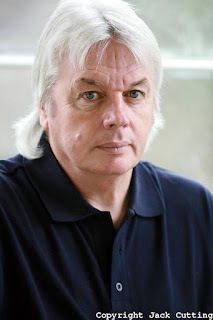 For those that do not know who David Icke is he is an authority on the reptilian conspiracy theory. He proposes that reptilian alien bloodlines have ruled over man since the time of the ancient Egyptians, and even before that. He has some pretty off the wall claims, but I don't believe that they should all be discounted. You see there is a world-wide conspiracy going on with figure heads in a global elite. Whether or not they are reptilian is besides the point. The point is we the people have never been in control through elections and state representatives like the idea of 'democracy' would lead you to believe. The real power lies in secret organizations and fraternities that run the world in the background. These people are not just money hungry, they are power hungry. David Icke used to be a sports reporter for the BBC. He was then visited by a psychic that told him he was destined for much more in life, and that his role on this Earth would be a very important one. This is when David Icke got on the Terry Wogan show, and actually spoke about the Babylonian Brotherhood, and the reptilian agenda.He became the subject of ridicule over night. Now people that actually believe in the New World Order, and a global conspiracy are considered nut jobs because of David Icke's off the wall theories. I say, it is better to have a theory why things are so terrible on this planet, then to be a pacifist, and act like nothing is going on. David Icke's message is an important one in that, there is something globally controlling each and every one of us, how it is done, and the true nature of who they are, is obviously kept very secret. At least he is trying to figure out the truth as we all should. I have read David Icke's books 'The Biggest Secret', and 'Children of the Matrix' and both offer really good information. In any thing you read, you should not believe 100% of what you read, but getting to the truth is a divine path that must be traveled. No one should be ridiculed for that. Credo Mutwa is a shaman that lived in Africa at the time of David Icke's interview with him. David Icke traveled all the way to Africa so that he may speak with this keeper of ancient knowledge. 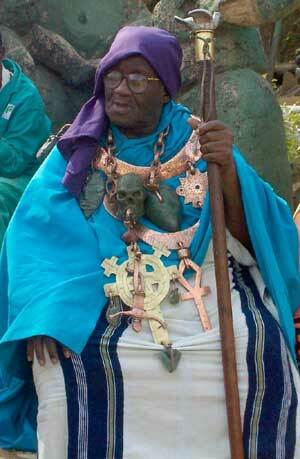 Credo has been initiated into many elder circles in Africa and knows much of what his ancient ancestors know. Although this interview was done 10 or more years ago, I think it is important to watch and to understand what Credo is saying. Is he just a story teller? You be the judge. I have not linked this interview before because it was something like a 15 part video series, now someone on YouTube has uploaded the interview in 2 parts. It is over 5 hours long. If you ever have the spare time to watch the whole thing please feel free to check it out. It is hard to understand what Credo is saying at times because of his accent, but it is still very interesting. Check it out when you get a chance. I have read Icke's book and completely agree with him in the matter of reptilians controlling our planet/people. I, however, don't see where he has an answer to the problem. God wouldn't leave us without an answer. Sadly, most organized religions are also controlled by the reptilians. Fortunately, one can have a relationship with God and His Son, Jesus, without going through the churches...just connect your soul to Him. If you read the Bible, you will see that He warns repeatedly about Satan (also referred to as "the dragon") and how to resist his mind control. Icke appears to have has a seething hatred for Jesus and Christianity. That leaves him open to be used by the reptilians he is trying to warn us of. They are more powerful than mortals, so to fight them, we need someone more powerful than them on our side...that being God. So glad I found this website and hope it is still going strong - as more than ever accessing the unadulterated truth is necessary and increasing daily. However, to me it is a reality, a knowing, that we are spiritual beings, given a physical body, to experience this level or dimension which this time around (in this life), is in a human body on Earth. But which and in greater part, is what I think of as the physical phenomena only found in the physical universe, which is subject to and in a constant state of flux or change. I know that indeed, what I term as my soul, is indestructible and the pure essence of the Supreme Being. I see the physical universe as a stage, a projection of the Supreme Being, and we the actors on it (think Shakespeare originally said this long time ago!) and that I have returned here to experience everything in full, countless times, taking on and experiencing every conceivable form existing within the physical universe, which of course translate into myriads of different forms, until a time came when my soul tired of it all and intuitively began seeking the way to its True Home in the pure spiritual planes, which are eternally the same and not subject to change (indestructible) and which are beyond the reach of the material or physical planes (universe). When the hunger in my soul became unstoppable, (some call it the Great Nostalgia), it was then that the Supreme Being, all knowing, made me realize that what I had regarded as a reality (life in the physical universe), was but a poor reflection of my spiritual origin, my true home. When this realization came, I began to feel like a spectator, no longer an actor on this stage. However, because human beings are all at individual stages of their spiritual development and most on the planet are still caught up in this web of unreality, most of the 7billion humans on the planet remain unaware of their eternal spiritual essence and heritage and this is as it must be until the time is right, by the inexorable laws of cause and effect, or action and reaction, another era or age of change is about to manifest. Still, many actively involved in this age of change, will remain involved and intrinsically part of it. While nothing can keep those filled with intense longing for their True Home bound to the physical universe, no matter whether the age of change brings about peace, prosperity and contentment. It is wonderful when we realize that we are not the physical body, but the soul within it - that the soul is who we really are and I think that is when we also understand and know we are one with the Divine Being, that the physical body confused and deluded us into thinking ourselves separate. All the constrictions and restraints we had limited ourselves to, then fall away and we become free and fearless. We then hold no judgment against any others, aware that they remain caught up in the play of the physical universe, as if in a dream, which indeed it is. Anyway, I wrote a very long comment, but felt it may give others commenting here some idea of how amazingly perfect the soul, our real being, housed within the human frame, is. So no matter what happens, whether we are called upon to play villains of the cover-up or the champions exposing it in this life, all of us have had a chance to be the hero or the baddie of the play, the ET's or the Reptilians etc etc, but the fact remains, we all have an immortal soul and will return here again and again, until all our desires are spent and the Great Nostalgia overcomes us to return to our true home with the Supreme Being. But this nostalgia only overcomes us when all desires of physical existence leave us and we become a stranger to it, which in reality we actually are. Thanks for reading Marly-Maris....I will be writing more articles soon....I have been really busy with work, but I am going to find more time to get back to my passion for investigative writing and research. Keep seeking the truth my friends.